Papaya is native to Mexico and South America. It is also grown in other tropical locations around the world. 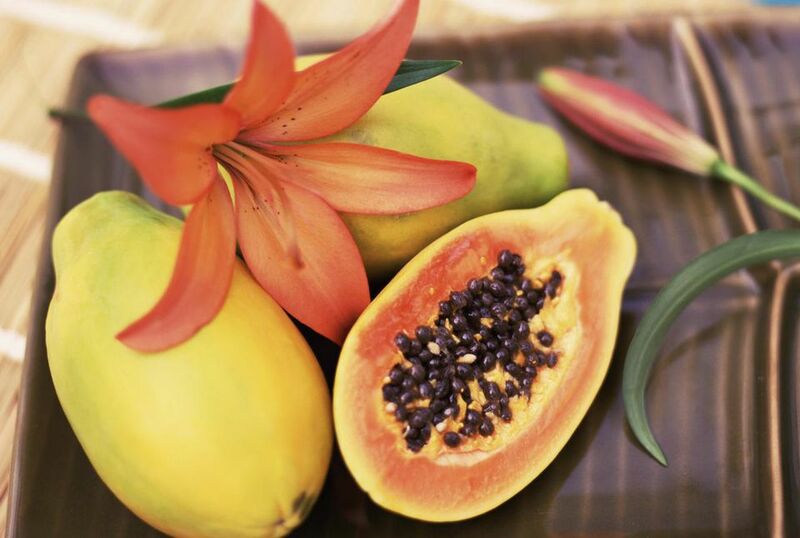 Fresh papaya fruit is available year-round in most markets, thanks to imported crops. Papaya nectar is available canned and bottled. Some markets also carry chopped fruit in juice in the cold case of the produce department near the juices. The peppery seeds are edible, yet the skin is not. As most Papaya consumed in the United States will have traveled a long distance, choosing the ripest fruit is important for getting the best flavor and knowing how long it will keep. As with most types of fruit, papaya has a short shelf life, so it needs to be prepared quickly. First, it's important to know what the fruit looks like. Although the papaya fruit can weigh in up to a whopping 20 pounds, the average papaya in the market is about six inches long and weighs from 1 to 2 pounds. Select fruits that are mostly yellow with a bit of green and let them fully ripen at home. When fully ripe, the skin is bright yellow. Unripe fruit will be an overall light yellowish-green, but not completely green. Ripe fruit should be firm yet yield to gentle pressure, feel heavy for its size and have smooth skin with no blemishes. As long as not a result of bruises or cuts, a few black or moldy spots are perfectly okay and will not affect the flavor of the flesh. As with most fruits, use your nose. The ripe papaya should have a sweet aroma. Avoid fruits that are overly soft unless you intend to puree them and use immediately. Ripe papayas should be refrigerated to slow down the ripening process. Papayas will ripen within a few days at room temperature, and even faster if you put them in a paper bag. Once ripe, this fruit will quickly turn to mush if not properly stored. Leave the skin on while the fruit ripens. Place ripe, whole fruit in a plastic bag in the refrigerator, and it should last about a week. To freeze, peel the papaya, slice lengthwise and scoop out the seeds. Cut into pieces and pack into rigid containers or heavy-duty plastic freezer bags. Cover with a 30 percent sugar solution (4 cups water to 2 cups sugar) and freeze up to 10 months. The thawed fruit will be soft so you may wish to use it in a partially-thawed state for fresh use applications. It will be fine for cooking purposes, although not quite as firm as fresh. You can also pop the thawed fruit into a blender for a puree or add a bit of water for a juice. Frozen fruit is a great smoothie addition. It can even be used in replace of ice.